Accidents involving the current generation of commercial airplanes are rare but offer important insights into advancements in the safety and crashworthiness of airplane design. These advancements reflect decades of innovation and targeted efforts to improve survivability in an airplane accident, especially during takeoffs and landings. Ongoing work with regulators has resulted in interiors that are designed to increase the survivability of accidents that occur during takeoff or landing. The accident fatality rate for jet airplanes has fallen dramatically during the last 50 years. This decrease is due in part to continuing efforts by airplane manufacturers and regulators to use information gained from accidents to develop safer, more survivable airplanes. This article provides examples of significant interior enhancements to Boeing airplanes and how they enhance airplane safety, particularly during accidents that occur during takeoffs and landings. Since the first passenger airplane was introduced in the 1930s, airplane manufacturers have worked to make airplanes safer for the passengers and crew who fly in them (see fig. 1). For example, Boeing has worked continuously to enhance the safety of its products and to lead the industry to higher levels of safety through global collaboration. Boeing airplane interiors have become both more comfortable and safer over time. By working together, regulators, operators, and manufacturers can maximize safety by sharing knowledge and targeting safety efforts to address areas with the most risk. Some recent events highlight the safety of today’s passenger jet airplane interiors during takeoff and landing accidents. In December 2008, an airplane crashed while taking off, ending up on fire in a 40-foot-deep ravine several hundred yards from the runway. There were no fatalities among the 115 passengers and crew, even though the metal fuselage had been breached by fire. In December 2009, an airplane carrying 154 passengers and crew overran the runway during a landing in heavy rain and broke apart. There were no fatalities. In August 2010, an airplane crashed while attempting to land during poor weather, breaking into three pieces on impact. There were 125 survivors among the 127 passengers and crew aboard the flight. The industry’s work on airplane safety and survivability of airplane interiors emphasizes three areas: surviving impact, surviving a fire, and evacuation. Survivability is greatly influenced by seat design. The greater the ability of airplane seats to remain in place and absorb energy during an impact, the greater the likelihood of passenger survival. In addition, the seat back is designed to protect passengers behind the seat from head injury. Seat design. In the 1930s, passenger airplane seats could withstand a static force six times the force of gravity (6g). For commercial jet airplanes beginning in the 1950s, the 6g requirement was raised to 9g. 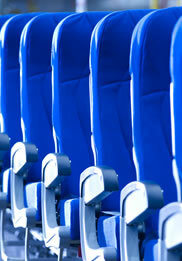 Today’s seats are required to withstand a 16g dynamic force. A 16g seat is tested in a manner that simulates the loads that could be expected in an impact-survivable accident. Two separate dynamic tests are conducted to simulate two different accident scenarios: one in which the forces are predominantly in the vertical downward direction and one in which the forces are predominantly in the longitudinal forward direction. The highest load factor is in the forward direction at a force of 16g. Head injury protection. Where head contact with seats or other structure can occur, Boeing provides protection so that the head impact does not exceed the head injury criterion (HIC) established by the U.S. Federal Aviation Administration (FAA). HIC measures the likelihood of head injury resulting from an impact. Compliance with the HIC limit is demonstrated during a dynamic sled test that includes a 50 percent male-size test dummy, the seat, and any airplane structure that could be impacted by the occupant’s head. In 1985, the FAA developed a new test standard for large surface area panels, such as ceilings, walls, overhead bins, and partitions. The standard required that all commercial airplanes produced after August 20, 1988, utilize panels that exhibit reduced heat and smoke emissions, delaying the onset of a flashover (i.e., the simultaneous or near-simultaneous ignition of all flammable material in an enclosed area). 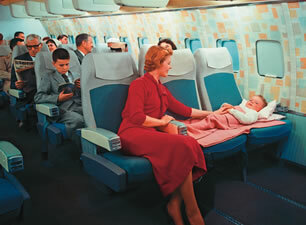 Interiors are updated and refurbished many times during the life of an airplane. This results in interiors that incorporate these enhancements even in older airplanes. In addition, airplanes manufactured on or after August 20, 1990, must comply with definitive standards of a maximum peak heat release rate of 65 kilowatts per square meter, a maximum total heat release of 65 kilowatt minutes per square meter, and specific optical smoke density of 200 (i.e., the OSU 65/65/200 fire safety standard defined by Ohio State University). The FAA requires that an airplane can be evacuated of all passengers in 90 seconds. Boeing airplane interiors include a number of features to facilitate this process (see fig. 2). These features include floor proximity lighting and escape slides. Because evacuating an airplane quickly greatly increases survivability rates, all Boeing airplanes include a number of features designed to enable evacuation within 90 seconds. Floor proximity lighting. When passengers evacuate after a crash, buoyant hot smoke and gases can fill the cabin down to near floor level, obscuring overhead lighting. Evacuation is improved through the use of lights, reflectors, or other devices to mark the emergency escape path along the floor. The FAA determined that floor lighting could improve the evacuation rate by 20 percent under certain conditions. As a result, the U.S. commercial fleet was retrofitted with floor proximity lighting by 1986, marking the completion of a two-year compliance schedule (see fig. 3). The 777 was the first Boeing airplane to include floor proximity lighting in production models. 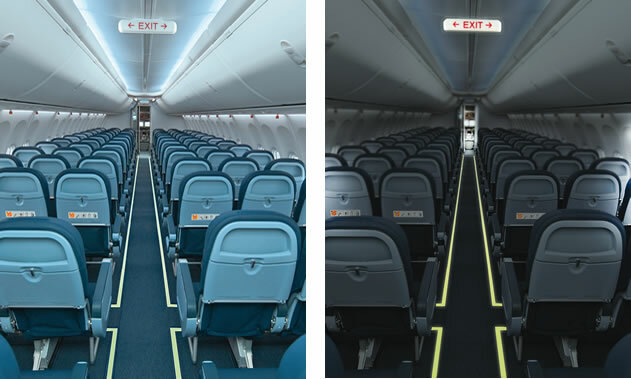 Floor proximity lighting aids airplane evacuation under dark or smoky conditions. Boeing has worked with regulators, operators, and industry to continually enhance the safety of its airplanes. This ongoing work has resulted in interiors that are designed to increase the survivability of crashes that occur during takeoff or landing. For more information, please contact Air Safety Investigation. Boeing and other airplane manufacturers are continually improving airplane safety by using information gained from accidents and by applying new technologies. The evolution of the escape slide is an excellent case in point. The handheld fabric chute came into use on passenger airplanes in the 1940s. It used essentially the same approach as the fabric slides used to evacuate burning buildings in the 19th century. 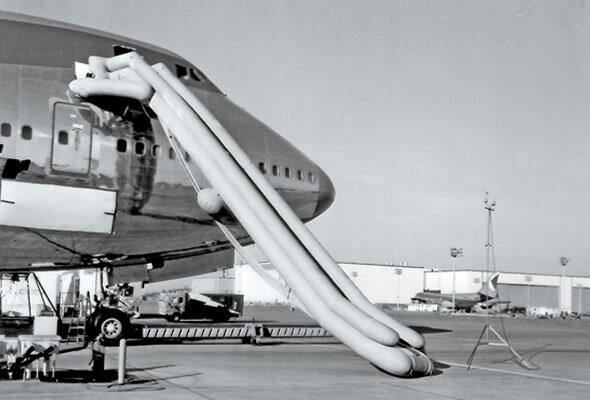 Inflatable escape slides became available about the same time as the early jet-powered airplanes were entering the final design stages in the United States in 1957. These slides used a tube-on-tube design, with the evacuee sliding on a large center tube with two side-rail tubes, an approach that greatly advanced safety standards. Because of the physical bulk of the escape slide system, it was not practical to locate the equipment anywhere except above the ceiling. As a result, deployment of these early slides was relatively difficult, requiring five separate operations to reposition the slide from the ceiling to the floor so it could be inflated — all after the door was opened. Ten to 20 seconds were required to deploy the slide and 15 to 18 seconds were required to inflate the slide, for a total of 25 to 38 seconds. The next major change in escape slide design occurred around 1960 with the introduction of slides with two parallel tube members with a sliding surface suspended between the tubes. A head tube at the top provided support and stability at the upper end of the slide, a toe-end tube provided ground support, and a cross-tube maintained side-tube separation. 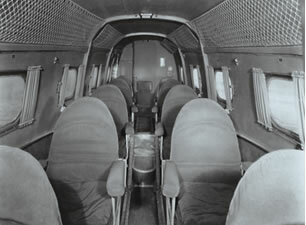 These new slides included a metal girt bar that allowed the slide to be attached to the airplane floor, a girt consisting of a fabric panel between the girt bar and the head tube to secure the slide to the airplane, and a manual inflation handle on the girt to manually inflate the escape slide. By 1963, improvements in materials and inflation systems reduced the weight and bulk of the slide system, making it practical to move the slides out of the ceiling to the lower inboard face of the cabin doors (see fig. A). This location resulted in a still more efficient escape system, reducing the time needed to ready an escape slide from between 20 to 50 seconds to between 18 and 24 seconds, including door opening time. Moving escape slides from above the ceiling to the doors greatly reduced the time required to ready the slide for evacuation. Further improvements in the efficiency of the aspirators that inflate the slides reduced inflation times to as few as six seconds by 1966. Detachable girts made it possible to detach the inflated escape slide from the airplane in a ditching situation to serve as a supplemental flotation device. Automatic inflation of escape slides was introduced a couple of years later, providing yet another element of safety: Untrained passengers could now open a door and inflate the slide during an emergency. Later, automatic escape slides became a requirement at all floor-level exits. By the last half of the 1960s, development work began to incorporate the features of a raft into an escape slide. The first such units were put into operation in 1971. This technology provided further improvements in passenger safety and eliminated the need to carry and maintain separate rafts, unless they were needed to supplement the airplane’s slide/rafts. Today’s escape slides are designed to accommodate all airplane attitudes, taking into account all combinations of landing gear position, loss of any gear, and varying heights of different airplane models (see fig. B). Slides inflate and extend to the ground automatically from varying airplane heights and attitudes. They are made with fire-resistant materials and remain rigid after being deployed. Materials used for slides resist burning and meet the latest radiant heat requirements. They are also resistant to fluids, food contamination, and exposure to sun. Door slides must inflate within 10 seconds after initiation of deployment, and off-wing slides must inflate within 15 seconds. They must be capable of supporting 60 persons per sliding lane per minute. And they must also be capable of being deployed into 25-knot winds from any direction. An extensive test program is carried out by both the escape slide manufacturer and the airframe manufacturer to ensure the escape slide system meets all performance requirements. This involves thousands of slide deployments and hundreds of live subjects. Fabric tensile and tear tests under normal conditions and when exposed to fluids and accelerated aging. Seam and adhesive peel and shear strength tests. Fabrics resistance to fungus, beverages, foods, and fluids including fuel, hydraulic and cleaning fluids, salt spray, sand and dust, humidity, and atmospheric pressure changes. Simulated rainfall to ensure that the sliding characteristics of a wet slide are adequate and safe. Lifecycle tests to 40 cycles. Beam strength tests to confirm the maximum number of occupants that can be supported by the slide without buckling. Centrifuge tests to assure that the escape slide system as a whole can meet maximum g-loads as required by the U.S. Federal Aviation Administration. Environmental tests to account for the environmental extremes of high and low temperatures to which the airplane will be subjected. Full-scale evacuations with live subjects to demonstrate that the maximum number of passengers the airplane can carry can be safely evacuated in 90 seconds with only half the exits available. Boeing Home | Commercial Airplanes | Contact AERO | AERO Copyright © 2011 The Boeing Company. All rights reserved.